Yesterday Advocate Sardar Mushtaq Gill was told on phone that in Phool Nagar the situation was gone bad while one Quran burning incident raised by Du-Band Sect of Islam,whole city became scared and alert. 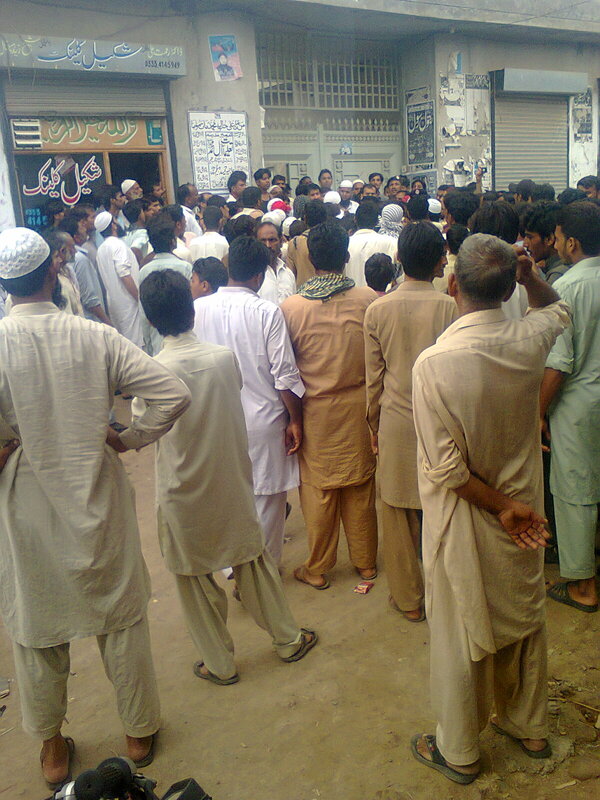 There is a Shia Madrasa and some Muslim students burnt the rough papers in which some pages of Quran also were burnt,this news spread in whole city and police officials reached at once within 5 minutes on place of incident.The High Officials of Police also reached to the area and they set a committee of all Muslim sects including Shia,Sunni,Wahabi and Du- Band.The grave issue is resolved today on this point that the accused is minor boy and Muslim,so need to proceed it.No FIR,No news in Press etc.On dated 29 May 2005,there was happened one blasphemy case against one Muslim School Headmaster name Ahmad Saeed Minhas.The Muslim persons accused him that he used abusing words against Prophet of Islam.He was beaten and tortured by Muslims but due to intervention of some persons his life was saved.This blasphemy issue also came to Police and High Police officials involved in it and they formed one Committee of Muslim Ulmas including members of all Muslim sects.The blasphemy matter was resolved without registration of FIR,not any threats to his family members,no threats to other Muslim Community. Why we say that Christians are not save in Pakistan under blasphemy law? The last year the case of Rimsha Masih displayed all that is wrong with Pakistan’s notorious blasphemy law.Rimsha, believed to be between 11 and 13 years old, comes from an impoverished Christian family living near the Pakistani capital, Islamabad. She suffers from Down Syndrome. Rimsha was accused of burning pages with Quranic passages not Quranic Pages, and police took her into custody on August 17.The whole Christian Community was reportedly assaulted.There was a mob demanding that police turn her over to be killed.Threats against the Christian community were also made, forcing almost 400 families to flee to other parts of the capital and driving the girl’s own family into hiding. On March,2013,there was happened a case of blasphemy against Sawan Masih,The case was registered and he was arrested,even then On March 09, 2013 near about 9:30 a.m., a fully charged mob of almost 4,000 religious zealots gathered around Christian Joseph Colony,a heavy contingent of police was deployed near the colony and later. Still, the mob in the presence of the police entered in the colony and started looting, turning more than 200 hundred houses into fires. Two churches, along with a chapel were vandalised and approximately 500 hundred Bibles were burnt. The furniture and other belongings of the school was also burnt. The Christian houses were damaged or destroyed, along with eight shops, many motorcycles, auto rickshaws, electricity meters, and gas meters. Where was Police High Officials in these blasphemy issues of Christians?Why the committees were not formed to investigate before the registration FIRs?Why other Christians made compelled to flee from their houses and many houses were burnt at Joseph Colony?Why death threats to their parents?Why the mob wanted to kill them?Why death threats to those who gave advocacy in such cases? Answer because of Christian Faith! In recent years, the Christians of Pakistan have become one of the most vulnerable religious community in Pakistan. Most of the time, the Muslim extremists use two common accusations to persecute the Christians: defamatory remarks toward Mohammad, and burning pages of Quran even some text of Quran written in other general books.The country's blasphemy laws "a major source of victimization and persecution" of religious minorities, who live in "in a state of fear and terror." The country's blasphemy laws are some of the strictest in the world, and include punishment – in some cases, imprisonment for life or death – for outraging the religious feelings of Muslims. This report is not just comparative of blasphemy cases against two different faiths,its purpose is to focus on truth that Christian has no place in Pakistan under blasphemy laws.